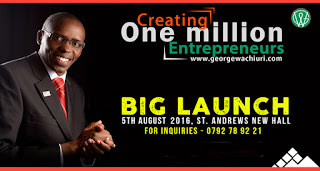 Optiven Foundation through its founder and Chairman, George Wachiuri will be launching the 'Creating One Million Entrepreneurs' campaign on August 5th at the St Andrews New Hall,Nairobi. The campaign is aimed at creating more youth jobs within the next twenty years starting August 2016 through to the year 2035 by funding top 20 - 50 youth business ideas in a month. 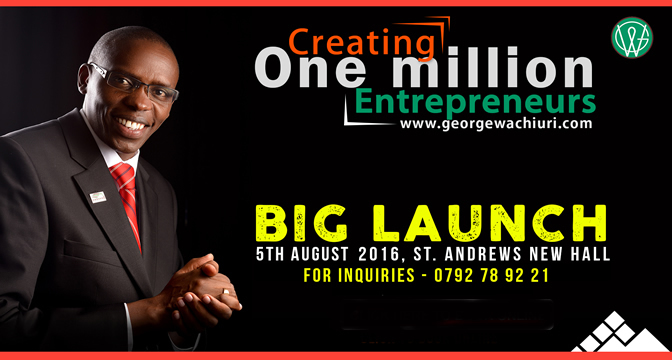 The main sponsor of the campaign is Optiven Foundation through its Chairman, Mr Wachiuri,who came up with the whole 'creating jobs idea' and vowed to put kes2million into the revolving fund.Other sponsors include; Ministry of Youth,KEPSA,Ministry of Industrialisation and any other interested parties are also welcome onboard. Competitions will be held to allow the youths to present their business ideas,after which the best 20 or 50 will receive funding.The winners will undergo a three months incubation during which they'll undergo mentorship and training before they leave to venture into their businesses. We'll give more updates after 5th August.